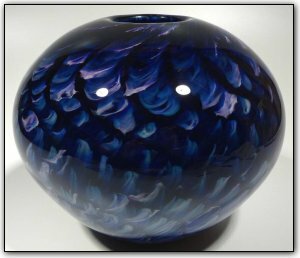 This deep and dark blue bowl features highlights of pinks, purples throughout. To help the colors stand out and to make them even more deep and intense, a technique was used to add a very thin layer of white in the middle of the inner color and outer color, making the colors just about jump out of the glass. Make sure to zoom in and see the intricate manner in which the accents show through and the way that the colors perfectly and complimentary interact with each other. Such a vivid and stunning bowl!